When setting up a new cash flow forecasting process, it is vital to select the right time horizon. This article will form part of a series we are producing which discusses how various different time horizons can be used in cash forecasting. This post will explore the 13 week cash flow forecast in detail. Selecting the right time horizon for a forecast depends very much on the business objectives of the forecast. By exploring the uses, benefits and drawbacks of the 13 week cash flow model, you should be able to ascertain whether it is suitable for your business needs. 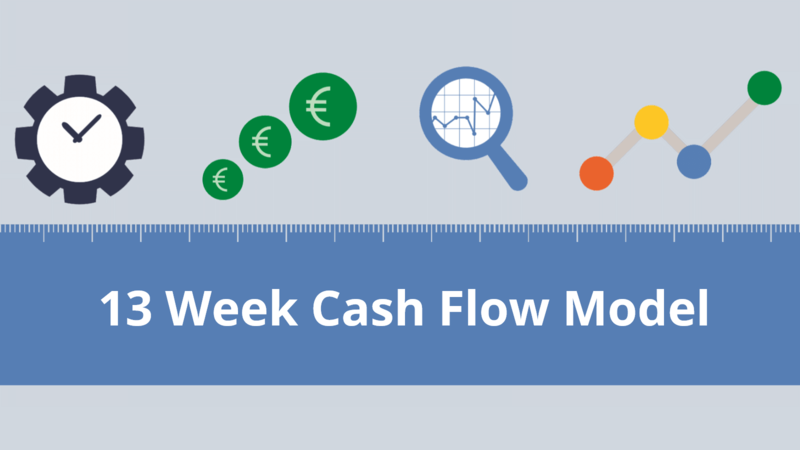 We chose to start this series of articles with the 13-week cash flow model because of its broad uses. Corporate senior management, including the CFO, are familiar with 13-week forecasts as they will use them in various forms of quarterly strategy and planning sessions. Similarly, investors often prefer the 13-week horizon as it gives them a reasonable view of the health of the company in which they are invested. The same holds true if a company finds itself in a distressed situation. In this instance a 13-week cash forecast should be able to identify when and how any potential liquidity shortfalls should hit a company. This therefore offers the ability to prepare for, if not rectify, any issues before they occur. A 13-week cash forecast is also often a requirement for bank reporting, or when submitting any lending requests. In short, while a 13-week cash flow forecast isn’t suitable for all requirements, it does have a broad range of applications. We will discuss these in further detail below. Weekly cash forecast showing actuals (far left column) and forecast figures (columns to the right). The time horizon of the 13-week cashflow model is short enough to support agile, tactical decision making, but also takes a long enough view to drive longer term decisions. The 13-week cash flow forecast also helps strike a balance between accuracy and range. It is a universal truth in forecasting that the accuracy of a forecast degrades the further it extends into the future. 13 weeks provides enough sight to have an impact on strategic decision making, while remaining short-term enough to be able to provide a high degree of accuracy. 13 weeks of visibility allows a CFO, treasurer, or financial controller to make medium-term cash management plans. This could include debt drawdowns and repayments, short term investments, or other management decisions. Taking a longer-term view, while 13 weeks is sufficient for medium term and month-to-month cash planning, it won’t overlap with longer-term plans which can extend years into the future. Because of this, there is little reconciliation required between plans. Medium and short-term planning decisions can be assisted by the 13-week forecast, whereas longer term planning remains in the purview of the overall business planning process. Most planning processes in companies produce monthly forecasts and budgets, offering limited short-term visibility. A 13-week cash flow forecasting process is usually broken down into weekly reporting periods, therefore offering four times greater granularity. This means that any short-term planning shortfalls can be addressed with a detailed look-through. Risk management is a key part of any cash forecasting process. Forecasting with a 13-week horizon should be accurate enough to identify any potential liquidity issues, while still offering enough time to take action to resolve those issues. For example, if a potential liquidity shortfall is identified with 10 weeks’ notice, the treasury team have ample time to prepare by arranging bank funding or reviewing intercompany lending options. 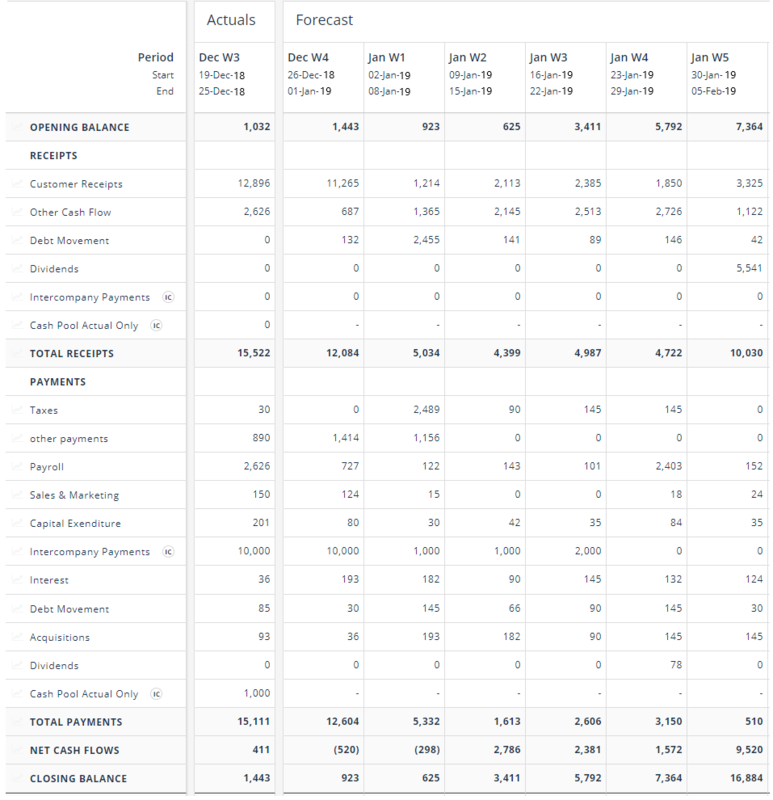 By covering a full quarter in scope, a weekly rolling 13-week cash flow forecast will always provide cash balance visibility on the next key reporting date or next quarter end. This is extremely valuable for the business, as senior management will always want reporting on cash balances that coordinate with their own key reporting dates. Depending on the ownership structure, debts, bank relationships, or investment status, a company may be compelled to produce a liquidity forecast with at least 13 weeks duration in place. It’s a key measure of good financial control and, from a bank’s or investor’s perspective, it provides clear visibility of the company’s working capital. When is a 13-week cash flow forecast not suitable? A shorter forecast horizon (perhaps of 10 business days) might be better suited if the business objectives are focused more closely on short-term liquidity planning. A shorter-term forecast could have a daily reporting granularity and therefore be able to report on high-level flows and balances with a high degree of accuracy at a more precise date in the very near term. While medium term liquidity issues can be identified and actioned with a 13-week forecast horizon, a 6-month forecast horizon (broken into weekly for 13 weeks and then monthly for the following 3 months) might be better at flagging up longer-term liquidity risk issues. As referenced at the beginning of this article, it is important to identify the right time horizon in order to produce the desired forecasts. Considering what the objectives of the forecasting process are, then selecting a time horizon which produces forecasts that meet those needs, is the right approach. Using specialised cash flow forecasting software can improve the accuracy and quality, remove the administrative burden, and increase confidence in a company’s cash and liquidity forecasts. For example, with rolling 13 week flow model, the weekly forecasts produced can be analysed at the touch of a button. Quick and easy forecast vs forecast, and forecast vs actual, accuracy measurement enables biases to be identified and adjustments and corrections made as necessary. Setting up a new process? If you are considering setting up a new cash forecasting process, we have written a cashflow forecasting setup guide, which we welcome you to download. The guide discusses; the practicalities of designing a forecasting model, what is required in preparation for the project launch date, as well as what comes after go-live.